Is this Torah and this its reward? is this torah and this its reward. a time so that he wouldn’t miss the call. no one, of course, noticed him at all. from the barrel of a tank. on a goat to die on the rocky cliffs of Azazel. On the day after Yitzhak Rabin was killed. The yahrzeit of Israeli Prime Minister Yitzḥak Rabin, assassinated on 4 November 1995, is י״ב בְּמַרחֶשְׁוָן (12Marḥeshvan). 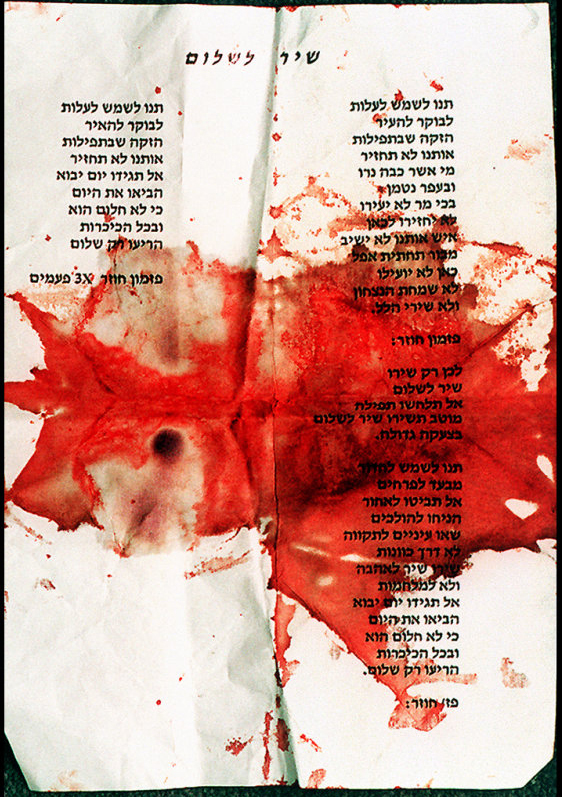 “קינה | Kinah/lamentation, by Aryeh Cohen (2004)” is shared by Aryeh Cohen with a Creative Commons Attribution-ShareAlike 4.0 International copyleft license. Aryeh Cohen the author of the book Justice in the City: An Argument from the Sources of Rabbinic Judaism is a professor, a social justice activist, a rabbi and a lecturer. He teaches all things Rabbinic Literature (Mishnah, Talmud, midrash) and social justice at the Ziegler School for Rabbinic Studies of the American Jewish University. Prof. Cohen is a founder and member of the Shtibl Minyan, and a board member of T’ruah: The Rabbinic Call for Human Rights, and CLUE-LA. Please reciprocate for any adaptation or redistribution of this work by (1) properly attributing the work to Aryeh Cohen, (2) clearly indicating the date you accessed the resource and whether any changes have been made (and if so, please be in touch with us and leave a comment below so that we might note your adaptation or improvement), (3) providing a link back to this source, and (4) specifying the Creative Commons Attribution-ShareAlike (CC BY-SA) 4.0 International copyleft license under which this work was shared.